Handrails are, by code, 34-36" above the finish surface. Rules and laws govern my creativity as an architect. These rules are very important but I am not a follow the rules person. I subscribe to the guidelines approach. So as a home bartender, I treat recipes like a vague client brief. I add my own thoughts, design, and garnish. Poorly structured metaphors (and puns) aside, experimentation is good. Creativity is vital. I believe recipes are the maps not the journey. Experiments fail. Failure helps us learn. They build character. And also waste good booze. This is where the idea of recipes as maps works well. Reading recipes and relearning proven ratios is step one in building a foundation for thoughtful experimentation. Making Vieux Carre experiments requires a good understanding of the original cocktail, the new, alternate ingredients, and learning about rinsing a glass. Step two is developing a wide palette. There are a few paths to the wide palette. Time. Purchase. Paths that are not always open. What can information can be get from history? I think culinary history is an endless collision of flavors seeking to combine to greater ends. One group of humans using the flavors of another. To describe how successful flavor combinations have evolved would take a massive amount of research. Detailed notes are a must! 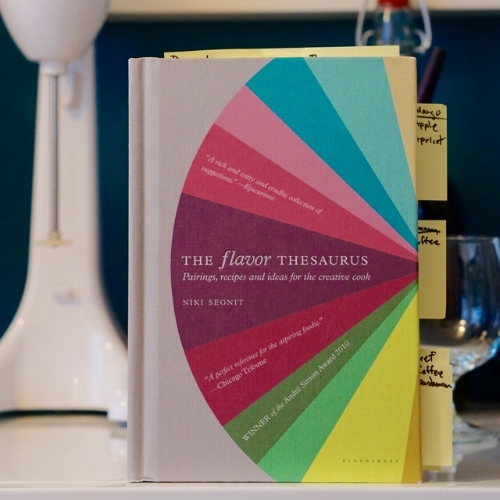 Enter The Flavor Thesaurus by Niki Segnit. This book's research will help boost the chances that your experimental drink's hypothesis gets proven time and again to be delicious. Segnit breaks down flavors into 16 categories made up of 99 popular ingredients and arranges them like spokes on a wheel. It is beautiful and functional, much like a color wheel - similar flavors are adjacent and complementaries are opposite. Segnit uses the wheel to write about flavor combinations. These combinations are described by simple facts, ideas, histories, inspirations, or my favorite (oddly) - emotions. "One wintry afternoon we inserted the car into the herringbone pattern of trucks and made our way under the low lintel to the strip lit interior of the building...It wasn't long before we, too, were hunched over our food, just as jealous as the wordless routiers patting flakes of pastry off their stomachs." Flavor combinations familiar to cocktails enthusiasts litter the book. Cinnamon and grapefruit (Don's Mix). Present. Anise and orange (Harvey Wallbanger). Present. Lime and ginger (Trademarked Rum Mule). Present. At this point my brain begins to storm. Dark thoughts, I had. Until inspiration stuck. Why a highball? Why ginger beer? Thinking differently about the basic lime and ginger combination produced the Off Trademark Traditionally Delicious daiquiri using Plantation O.F.T.D and King's Ginger Liqueur. I could go on with the flavors in liqueurs. Vanilla and nuts go really well (ie. Frangellico, or even better - Frangellico on Vanilla Ice Cream!) I encourage everyone to know what is in their liqueurs and how the building block ingredients in them combine to produce distinct, harmonious flavors. It will make your creative process more thoughtful and intentional. Orbiting around the flavor wheel you'll pass a few sections that might help with a food pairing but will be little help in fulfilling our cocktail mission. I'll be skipping the meaty through marine sections (...maybe a citrus forward gin, dry vermouth and a bar spoon of clam juice?!?!) and choosing two combinations that are off the beaten path in cocktails, but still within sight of the trail. Cardamom and coffee has a rich tradition in Arab culture, where coffee is often brewed with a few cardamom pods. Word of caution when infusing with cardamom: Better to go with fewer pods, a longer duration, and lots of check-ins when infusing. Hitting the right amount of flavor is going to be very personal. Cardamon is a strong flavor that will conquer everything in its path. It is a Dothraki horde. I infused my first attempt i used 3 pods, cracked, in 4 oz of Flor de Caña Extra Secco. While I found Flor to be a good (pretty bland canvas...) in the past, cardamon walked all over it inba day and left little rum flavor. The next attempt went with 1 pod, cracked, and 2 oz of Caña Brava. I let this one sit overnight. Tasted. And let it sit for a few more hours until I thought the flavor was present but not dominate. Coffee and pineapple also make good friends as well. First, The Rum Society 62 and Giffard Banane du Brésil go together like butter and jam. The Ramazzotti is the stable but complex toast. Cherry turns it up to Sqirl levels of toast. Secondly, this was a very delicious drink. I had to make it a few times just to fact check for publication. A kitchen torch is on my Christmas list. I think a bruléd banana and crispy candied cherry would take this garnish to an 11 - just in case it is needed. This book will be placed with pride on my shelf but will often be found open, tagged, and referenced.